Olsen’s Chino Chick Season 2019 – New baby chicks are scheduled to in late February at Olsen’s Chino Valley store— please check the listing below for chick types and quantities. Chick types and date are subject to change. 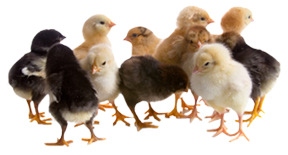 Please call Olsen’s Chino store at 928-636-2321 to confirm quantities and chick types are available in store. Now is the time to start your backyard flock or add to your coop! Hurry in for the best selection of the chick types you want this Spring! Follow us on Facebook for new Spring chick arrivals. Check out the schedule below for other Olsen’s store locations to see upcoming chick arrivals and details. Are you set up for a successful flock? Olsen’s Grain stores offer all the chicken supplies you need to raise a healthy flock: poultry feeds, coops, feeders, waterers, shavings, heat lamps and more! Save the date! Make plans to attend our FREE Chick seminar at the Chino Valley Store! This entry was posted on Thursday, January 24th, 2019 at 11:42 am	and is filed under Chicks, Events, News & Updates. You can follow any responses to this entry through the RSS 2.0 feed. Both comments and pings are currently closed.